This is the complete text of a small book published in 1895 to honor the new mayor of San Francisco, Adolph Sutro. Sutro ran for mayor as the populist "anti-octupus" candidate, in opposition to the Southern Pacific Railroad, which dominated California politics. 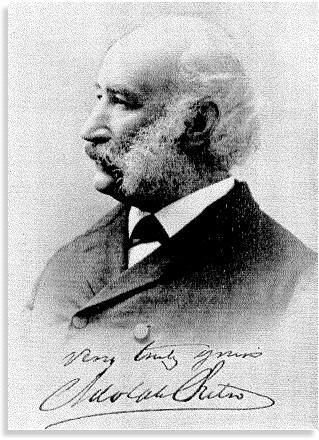 Adolph Heinrich Joseph Sutro was born April 29, 1830. He was well educated in the field of mining engineering. Sutro arrived in San Francisco aboard the steamship California, in 1850, and immediately engaged in trade, first in San Francisco and, later, in Stockton. In 1859, when the Comstock Lode made headlines, he was again attracted to mining. He established a small mill, called the Sutro Metallurgical Works, in East Dayton, Nevada, for the reduction of ores by an improved process of amalgamation and was responsible for the planning and building of the Sutro Tunnel. This tunnel made it possible to drain and ventilate the many mines in the Comstock Lode, and to permit the miners to bring out the rich silver ore. In 1879 Sutro sold his tunnel to the McCalmont Brothers, and countless lesser investors, and returned to San Francisco. In 1894 he ran for mayor on the Populist ticket and served one two-year term, and was succeeded by James. D. Phelan. At one time Adolph Sutro owned one-twelth of the acreage of San Francisco. 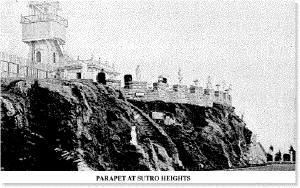 he purchased the Cliff House in the early 1880s, and one thousand acres of land facing the ocean, now called Sutro heights. 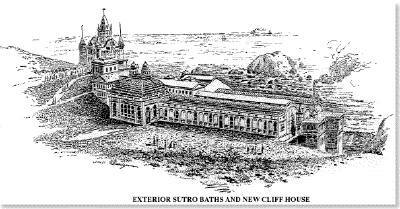 He built the Sutro saltwater baths and planted Sutro Forest. He owned the finest private libary in America, much of which was destroyed during the fire that followed the Great Earthquake of 1906. 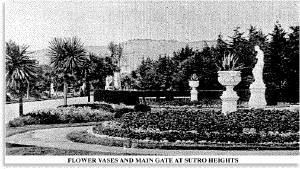 Sutro died in San Francisco August 8, 1898. Art illustration for this book is by Carl Dahlgren (1841-1920), a San Francisco artist. Little is known about Eugenia Kellog Holmes. The California State Library system holds only this work written by her. At Aix-la-Chapellethe German Aachenan ancient and imperial city, capital of the district of that name in Rhenish Prussia, one of the three divisions skirted by the storied Rhine, the location a delightful and fertile valley, girdled by frowning mountains, dense with dark forests and further fortified on the lower levels, by grim ramparts that screen its charm of chapel, palaces, promenades and park from the gaze of the travelerthere was born, April 29th, 1830, of German parents, distinguished for their thrift, industry, and integrity-a son. By the birth of that son, the City of San Francisco, the State of California, and the world of which these municipalities form so important a part, is enriched to a degree inestimable, since the qualities which form nobility of character are incalculably precious and therefore beyond the judgment of men. Amid scenes and associations unparalleled in historic trophies, the youthful years of this scion of the sterling virtues were passed; for Aix-la-Chapelle, known in learned Latin as Aquis Granum, received its name from oneSeverus Granius, a Roman commander, who is supposed to have founded the town about A. D. 125. Certain it is, that Aquis Granum became a favorite resort of the Romans, who first sought it for the natural sulphur springs abounding there, renowned for their alleviation of varied infirmities, among them acute cases of rheumatism and gout. This was long before the advent of the Emperor Charlemagne, who endowed it with added dignity by making it, during his dynasty, the first city in the Empire and the capital of all his dominions North of the Alps. A magnificent mausoleum there marks his remains; his statue, in bronze, adorns the market place; his fountain sprays the bearded trees; planted it is said, by him. The chapel where he worshipped, and where repose his remains, contains relics of reputed antiquity, which are objects of exceeding veneration by the children of the Roman Church, who assemble there in great numbers every seven years, when the relies are placed on exhibition. For the citizens of Aix-la-Chapelle the giant Emperor is said to have cherished a singular affection, his favor partaking of the form of the conference of numerous privileges, such as exemption from military service and the payment of taxes. The wall which surrounds this favorite residence of the Frankish Kings was built by Charlemagne, and subsequently stormed by Otho of Brunswick, in the year 1198, and by William of Holland, in 1247, to whom the city surrendered after a siege of six months. This wall, pierced originally by ten gates, and partially demolished by the Hollanders, was rebuilt and strengthened by Frederick Barbarossa, whose fondness for this Flysian of the ancients equaled that of the natives, who were wont to say with pride, "After Rome  Aix-la-Chapelle." It was here that Napoleon the First rested, when wearied with war's rude reveilles. Long ago the vandals razed the favorite palace of Charlemagne, and upon its ruins, by way of complimentary apology, was erected Coronation Hall, where his successors, for more than seven centuries, have been crowned. Two towers, of ancient Roman origin, rear their stately battlements above the marts of manufacturers, mechanics and the kinsmen of commerce, in silent scorn, it would seem, for those usurpers of the picturesque; but the springs, where Kings loved to drink and bathe, remain unchanged. Ephen, the favorite hunting ground of royalty, situated within the environs of Aix-la- Chapelle, where the meadows are gay with green and bloom, and where nightingales warble among the tender leaves, is still sought by weary wanderers, who, like Imperial Charlemagne, suffer the balm of nature to soothe life's gnawing cares. Though the commercial tendency of the age conduces to little reverence for the hallowed, the historic, the picturesque, yet those who are truly reflective must acknowledge the value of these mute, invisible sentinels. We are all products of the past, and with it our lives are indissolubly linked. Such sentiments seem inseparable from a study of the early life of Adolph Sutro, for as a lad, we may without elasticity of imagination, behold him alone and aloof from others of similar age; ruminating among the ruins of European rulers; delving into the intricate things of earth; scanning the mysteries of wave and wind for an intelligible answer to his earnest queries; experimenting with tangled shreds of dismembered machinery; tracing the starry constellations with a tiny telescope; such having been his youthful occupation, and as such be remains a part of the wise, serene, philanthropic, patriarchal old world. A region of new, raw, jarring, nerve-destructive environments could not have produced a Sutro. At the age of sixteen, much to his regret, the young student left school to assume the superintendence of his father's factory. Two years later, such being his acquired competency, he was intrusted to the more important post of establishing a similar store at Menel, in Eastern Prussia. 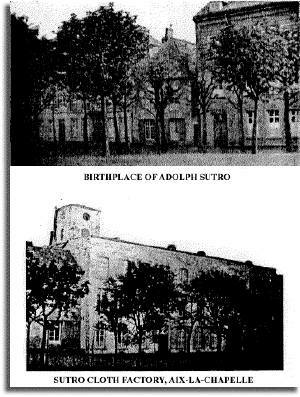 The death of Mr. Sutro, Senior, in December, 1847, increased the son's responsibility, the business by that event becoming family property, under the sole management of Adolph and his brother. But for the Revolution of 1848, which sent a shudder through Europe, menacing the securest form of government, disorganizing business and sundering the sacred ties of kindred, it is presumable that the brothers might have continued in uninterrupted prosperity the work of manufacturing cloth, after the manner of their sire. The universal crash, however, could not but affect the firm of the Sutros. There was no alternativeit had to be given up. With a ready resolution and unerring breadth of vision for which she was remarkable, Mrs. Sutro decided that there was small prospect in the Fatherland, under the circumstances, for such a future as she aspired too for her family, composed of eleven children. The choice of a foreign home was deemed imperative, and the lady favored America. In the Autumn of 1850 the Sutros landed in New York, and subsequently settled in Baltimore, Maryland. It was about this time that the California gold excitement waged most fiercely, when armies of men forsook the fetters which civilization had forged, and fled, with a speed impeded only by the pathless plains, the desert wastes, the hostile savages, the treacherous winds and tides, to the far-fabled shores of the Pacific. Young Sutro readily grasped the meaning of this excitement, being among the first to take passage on a sailing vessel bound for the port of San Francisco. During this voyage, which lengthened to months, the winds being variable, the ambitious adventurer beguiled his time by writing letters, descriptive of scenery witnessed, the strange and interesting types of life encountered, and in keeping an accurate record of occurring incidents. Those letters, addressed to his mother and sisters, are still extant; their contents bespeak the same appreciation of nature, comradeship with humanity, independence of action and unswerving, lofty purpose, which has since been brought to such conspicuous fruition. 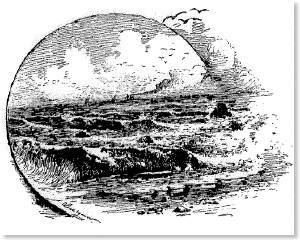 November 21st, 1851, marks the date of Mr. Sutro's arrival in San Francisco. His fortune at that time consisted solely in youth (he was less than twenty), health, hope, courage, ambition and indomitable energy. With this uncurrent capital he went into business on the water front. For nine years he worked hard in what is called petty trade, buying, selling, keeping a limited supply of the best cigars and tobacco; living, as those have ever lived who toil without compensation, other than frugal food, few comforts, and the recreation which exists only in name. During this period of time (the year 1856) Mr. Sutro married, and was thereafter encouraged and assisted by a faithful, fond wife. "But for her,"he states in one of his public addresses"I should have lost heart altogether, but my wife never repinednever reproached me for the poverty with which we strugglednever wavered in devotion. Six childrentwo sons and four daughterswere the result of that marriage. They were trained in the healthful simplicity which forms the firmest foundation for mental and physical perfection. All survive their mother, who died December 8th, 1893, at the Hayes and Fillmore family residence, in San Francisco. Those survivors are Mrs. Albert Morbio, Mrs. Moritz Nussbaum, Mrs. Dr. Sutro L. Merritt, Miss Clara A. Sutro, Mr. Charles W. and Mr. Edgar Sutro. Each is personally identified with some practical work, of a character largely philanthropic. From the monotony of a life devoted to domesticity and the routine of retail trade, Mr. Sutro was at length, stirred by a sensation electrifying to the Pacific Coast, and extending in its interest, to remoter regions. The occasion was the discovery of the Comstock Lode, in the State of Nevada. Mr. Sutro visited this exciting section for the first time in the year 1859, and there found the opportunity to apply the scientific knowledge gained by years of patient study. The immediate need of ventilating and draining the mines, was impressively apparent to the young man, who saw that great volumes of water impeded the progress of labor and its reasonable reward. Pumping it was a costly and most precarious experiment; a depth of 1500 feet had been reached; the temperature in the lower levels was 110 degrees, rendering work almost impossible for more than a very brief period. The air was so foul that the men who inhaled it, fainted in those poisoned caverns and felldead. If I could but drain those mines!" was the thought that flashed, as Heaven-sent inspiration, through the freighted chambers of a fertile brain. This thought found expression in a letter, first published in the "San Francisco Alta," April 30, 1860. "An unfeasible plan!" "The audacity of a dreamer!" sneered the pessimistic, for well they knew that a gateway through granite needed the resonance supplied by bonds and coined securities, ere the hidden treasures of the caverns would be made to surrender. The young man, whose fortune was then locked in the rigid fastnesses, heeded not the hissing voices of harpies, but, by his own individual effort, alone and unaided, secured the right of franchise to those remote recesses. His subsequent tasks were to obtain and retain the confidence of capitalists at home and abroad; to maintain control of political power in Washington, in London, and San Francisco; to make frequent marine and overland voyages extending over two hemispheres; to watch, at the same time, the progress of work at the mines, and act as their superintendent. These were Herculean tasks, combined with hazardous venture, manual toil, and diplomacy unparalleled in the history of Courts, Kingdoms or Republics. After the merits of the enterprise were fully understood and recognized, there followed even more desperate struggles to maintain it against conspiracies combined to thrust Mr. Sutro out, that others might appropriate the result of his efforts. Only faith, preeminent and unswerving, in the project sought, coupled with unremitting industry, could have carried such plans to successful completion. It was accomplished however, exactly as proposed, and occupied its originator, fourteen years of such effort as few men could have approached. 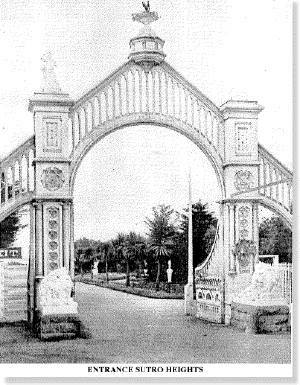 The tunnel, linked inseparably with the name of Sutro, was finished October, 1878. Its dimensions were 10 feet high, 12 feet wide, 20,500 feet long, with North and South branches having 3600 feet in the aggregate, making its entire length more than five miles. Its cost, without interest, was $4,500,000; including interest, $6,500,000. From the corporation he had organized Mr. Sutro at length relinquished all monetary interest, retaining an amount to his credit of not less than $5,000,000. With it he returned to San Francisco, his favorite city, there to permanently reside. About this time the "sand-lot" agitation had greatly depreciated the value of real estate in that locality. From a close study of the soil and its varied resources, the Seer of the sand hills knew that not a rood of the yellow dunes, sprayed by the swirling surf, would one day be worth less than its weight in gold, though it was then without shred of green, or glance of rill, or glint of bloom. With the breadth of vision, unerring judgment, and prompt action which had brought the tunnel to successful completion, Mr. Sutro invested vastly in shore lands, believed, by the then doubting public to be worthless. Men were employed for the improvement of those and acres, who, under the master's direction, pierced the subterranean depths by shafts and pumps; sent iron conduits through the stubborn hills in search of the needful water; blasted the rocks and had them cut into staircases, parapets, and the walls of lake-like reservoirs. Millions of tender seedlings were planted in the sear spaces and gently nurtured in the plastic sands, softened by soothing water brought from the summit stores. These, Mr. Sutro calls the children of his age, for tree planting, with him, is a labor of love. Those infant forests have grown to sturdy groves which skirt the horizon with swaying leaves. Playgrounds, especially provided for children, are on those wooded hills, as well as reposeful places for gray-haired adults, who find solace, sweet and inspirational, in the song-haunted shadows. At Sutro Heights, a superb suburb of the city of splendid eminences, situated upon a natural walled promontory, overlooking lone Tamalpais, the mist- mantled Farallones, the gleaming Golden Gate, statue-crowned Mount Olympus, sapphire-hued seal rocks, the sea, the beach, the golden-globed sunsets, are shrubs and flowers of every zone, trained in carpeted rainbows, leaf-woven bowers and embroidered boulevards. The more delicate exotics, formed to flourish in tropical climes, are sheltered from the harsh winds and dense fogs of that aerial altitude in a glass conservatory,but one among the many attractions of this idyllic spot. The statuary, set in the niches, terraces, parterres, parapets, along the tree-lined walks and drives, are copies of celebrated sculpture, transported with great care from European capitals. The residence, quaint and unique, is gemmed with speaking souvenirs of Mr. Sutro's many tours in every accessible part of the world, each an expression of taste, intelligence and appreciation for the best in human skill. The rich, the cultivated and traveled find there, environments of harmony, while the poor are not pained by ostentation nor cankering contrasts. Among the visitors entertained at the white-towered cottage on the cliff, may be mentioned the Notables of all nations, friends, kindred and acquaintancesrepresentative of every class, for this famous sea-park is closed to none. The mailed knights at the gates are hospitable. The snowy-lipped lions at the lodge are locked in reposeful slumber. Mr. Sutro has said in public print " San Francisco has a hoodlum and criminal class, but when the members of this class have visited the Heights they have always behaved themselves," proving their admittance thereto, and their respect for the privilege. But Mr. Sutro does not, in his lofty eyrie, on the cliff's crest, surrender himself to the exclusive delights of entertainment. Much of his well-earned leisure has long been devoted to the construction of a monument more enduring than any possible triumph of marble or bronze, museum, tunnel, grove or garden. This is the Sutro Library, conceded by men of the highest scholarship to be one of the four great libraries of the United States. Three, hundred thousand volumes have already been collected by agents stationed in the best Continental book marts, and additions are being constantly made. Among the rarest tomes and incunabula, may be mentioned duplicates of the early printer's art, from the famous Munich Library, four thousand in number; folios of the classics from the monastery of Boxheim and the Duke of Dahlberg, the Sunderland Library and the confiscated monasteries of Bavaria. There are Mexican works, relating to the war of independence, from the ancient archives of the Aztec capital; two thousand three hundred Japanese manuscripts were borne from the bright land of the "Morning Calm; " collections of Semitic philology, the chemical literature of the late Secretary Wells, of the English Society of Industrial Chemistry, have furnished about two thousand five hundred volumes. A complete military, architectural and botanical library contributes its golconda of treasure; antique and priceless scrolls from the Orient are preserved with the parchments of Maimonides, author of "Ram Bam," who was called the Light of Israel, the Star of the West, and the Great Eagle. Classics, poems, plays in all languages of the learned, are in those closely packed cases, book-lined walls, and heavily-laden galleries which contain, temporarily, the greatest wonders of the printing press known to the New World. When completed, as designed, it will be accessible to every disciple of science, that being the special motive of its magnanimous founder. The structure site chosen for this colossal collection of literary treasure is in Golden Gate Park, near the music stand. It will be fire proof and free to the public. But not alone in the absorbing walks of the bibliophile, the charms of hospitality, the conflicting cares of exalted office does Mr. Sutro find entire concentration ; his active brain demands perpetual achievement. 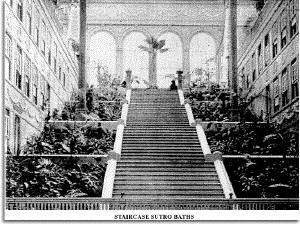 The more recent of these achievements partaking of the form of baths, which rival in magnitude, utility and beauty, the famous abluvion resorts of Titus, Caracalla, Nero or Diocletian. Those wonderful expressions of architectural skill  airy, graceful, yet substantial  are located in a wave-worn cove at the foot of the cliffs, and brought to utilitarian perfection by a triumph of engineering invention. This consists of a series of basins, blasted in the rock, which receive the water pure from Ocean's briny caverns, by a complete system of tunnels and canals, so ingeniously devised as to supply the receptacles with both hot and cold currents, and drain them, after use. Thus have the tides been harnessed and made subservient to the multitudes. 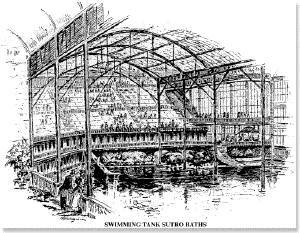 There are six swimming tanks, the largest being L-shaped, three hundred feet long and one hundred and fifty feet wide at the furthest extremity. Another is fifty by seventy- five feet, reserved exclusively for women and children. Four are, each, twenty-eight by seventy-five feet. The depth of the water varies from two to eleven feet. All these tanks are walled and floored with creamy concrete, deluged or drained when desired by the simple turn of taps. Spring-boards, toboggan slides, trapezes, bars, swings, and all purchasable paraphernalia, are provided for the promotion of aquatic sports, and afford agreeable access to the water. Five hundred dressing rooms, perfectly ventila ted, heated, lighted by electricity, furnished with showers, soap, toweling, bathing suits and all necessary toilet articles are reached by the aid of spacious elevators and broad staircases, that lead likewise to arcades, pavilions, balustrades, promenades, alcoves and corridors adorned with tropical plants, fountains, flowers, pictures, bric-a-brac, the collected treasure of foreign travels, in bewildering and most beautiful variety. The facade has a portico with four Ionic columns and pilasters which lead to a noble staircase, wide, gradual of ascent, bordered with broad-leaved palms, the flowering pomegranate, fragrant magnolias and the lance-like arms of the reaching maguay. This staircase touches the very rim of the reveling waves. The foyer, on Point Lobos avenue, is in the Greek Doric cast of architecture, and conveys those who favor driving, to a carriage way that winds among tall terraces, rough-surfaced shelves and lichen- laced rocks, wrought by the warring winds and tides. A distinctly noticeable feature of this stupendous establishment is a stage, constructed for the performance of operas, dramas, acrobatic exhibitions, and the display of any talent or skill contributable to public entertainment. The seats, arranged in tiers, form an amphitheatre, facing the ocean side of the structure, and are walled with glass of many colors. The most fantastic effects are caused by the filtering sun, the reaching surf, the arching sky, the curving clouds, and those radiant mosaics. Whether the sunbeams are imprisoned and tempered, the glare of electricity softened, the great, green billows are broken in snowy embroidery upon the amber sands, or ivory fogs fold the fair battlements in a fond embrace, the result is equally inspiring, incomparable and indescribable. A seating capacity is afforded for twenty-five thousand spectators within the edifice, though larger numbers would scarcely strain it; accessible on all days and at all hours, not merely to bathers, but for the promenader, the leisurely stroller, the artist, the student, who finds rare and fascinating subjects of thought in the girdling galleries, draperied balconies, mazy staircases, Sequestered alcoves and statued niches, fanned by ozoned winds, embellished with every visible enchantment, treasurable from the mystic museums of the past. A man, however, may build and yet not be a master architect, though his buttressed walls be as adamant, his shafts and spires and towers soar starward. That structure, surpassing mortal conception, must bear harmony with humanity, else it is like unto the "baseless fabric" of a dream. From his vast and varied creations, it might be inferred that Mr. Sutro is a man of force rather than feeling, of rigor rather than repose; but the fallacy of this inference is proven by his treatment of the poor, which is always more deferential than of the rich. So considerate of the unfortunate is this prince of finance, that he has been christened by a wag not wholly witless, the " Czar of the Scavengers." In the winter of '93, when great suffering prevailed among the indigent unemployed of San Francisco, Mr. Sutro purchased tickets from the Salvation Army to the value of eight hundred dollars, as occasion required, which were distributed, upon application, and secured to their holders a least temporary relief. His contributions to all public charity, since his arrival to opulence, have been munificent, and confined neither to race, creed nor class. His private alms are said to be limited only to the immediate needs of the individual. A princely jpgt, consisting of twenty-six acres of land, to the University of California, the chosen site of the affiliated colleges, is among the many and more recent monuments to the name of Sutro. Geographically, it is located near the center of the City and County of San Francisco, two blocks south of, and near the entrance of Golden Gate Park proper, on a gently rolling eminence commanding a noble landscape, which embraces the ocean, Golden Gate, the shores of Marin, the hills of Contra Costa. Personally, Mr. Sutro presents a rare combination of strength and simplicity suggestive of a seer, a child, a diplomat, a courtier, a sage; his words are few, deliberate, fitly chosen, and framed ever with becoming complaisance to, the opinions of others. That this personality is appreciated, his great services to the State recognized by the people, could not have been more emphatically illustrated than in his election to the Mayoralty, when he received a vote greater than the combined number of his four opponents, and against the opposition of every daily paper, political organization and moneyed corporation in the city. This election is the signal of something more than an expression of sentiment. It means a vic tory of honest elements in monopoly-enslaved San Francisco. It marks a new epoch in municipal affairs; it has infused new life and energy, hope and aspiration, long stifled by the strangling clutch of corporations; it has clearly demonstrated Mr. Sutro's claim to the title of reformer, by an achievement of that which no man, heretofore, has ever dared attempt on the Pacific Coastnamelya championship of the people's cause; and the time was ripe for the champion of such cause. The masses, long steeped in enfeebling apathy, engendered by a piratic plutocracy more dangerous and degrading than foreign-forged fetters, or the slavery of our own South, have shifted their shackles, and rise, in response to their leader's call, assertive of their sullied, but none the less free birthright; for Mr. Sutro knows no interests inseparable from those of the people. To those who best know this soft-voiced, tranquil-eyed, gentle- mannered, seer-souled man, it seems a harsh and altogether incongruous dispensation, thus to descend from his regal eminences among the flowers and forests, and fair, fine things which his own excelling fancy has flung there, on the rugged rim of a savage world; to breathe an atmosphere freighted with the poison of political feuds, fraud, contention, avarice, artifice and all the vitiated currents of a corrupted municipality; but a motive mightier than is known to his critics guides the master spirit, whose deeds speak in tones more thrilling than ten thousand trumpets; whose monuments rise from every rood of ground within the Sunset City's spacious limits; where sorrow finds solace in his sympathy. Despair is lifted to hope by his bounty. Commerce is vitalized by his energy. Hospitals claim him as their benefactor. Schools own him as their patron. Art finds in him a supporter. The feet of progress are sandaled by his silver. Invention, by his fostering patronage, has successfully wrestled with the hidden forces of nature. Science leans on him, while her starry vision scales the infinite. Patriotism sings paeans for him, who in the hour of the State's struggle, sent the ringing gold of mercy to chime with the flashing steel of valor. In the life of all enterprise, the vigor of all progress, all expansive and ennobling unfoldment contained in the history of California, the name of Adolph Sutro is inseparably identified. To such there comes no age nor death nor oblivion.